Who among us did NOT rise at the break of dawn U.S. time to see Kate and William get married this morning?! Are you aware of our connections to the abbey? We owe those connections to our ancestor Lady Elizabeth Brooke. We are related to Edward the Confessor who dedicated his life to the building of Westminster Abbey. His cousin was Robert the Magnificent, a.k.a. “The Devil” – 5th Duke of Normandy. The Duke was the father of William the Conqueror; Robert and William are direct ancestors. FROM HEREON IN I’M GOING TO NOTE “DA” FOR DIRECT ANCESTOR. Note that some of the stories are so interesting I got a little carried away. William I, a.k.a. William the Conqueror (DA) was crowned at Westminster on Christmas Day, 1066. He married Matilda of Flanders (DA). She was crowned queen at Westminster in 1068. They had serious problems with their sons – who also had problems with each other. After William I died, their son William was crowned William II at Westminster on 9/26/1087. He was very much disliked and died (without heirs) in a “hunting accident.” He happened to be hunting with his brother Henry at the time. Henry (DA) was William I’s youngest and the brains of the family. Edith/Matilda was a great influence on him, but he still lost his temper, threw burghers* off towers and enjoyed blinding people. Matilda married Geoffrey V Plantagenet, 9th Count on 22 May 1127 in Le Mans Cathedral, Anjou. When Henry I died, Matilda was made queen of England for a short time. She was crowned at Westminster Abbey December 19, 1154. She had two strikes against her – she was arrogant and she was female. Despite their hate/hate relationship, Matilda and Geoffrey had an heir – Henry (DA). Henry’s mother lost her throne, so he worked to get it back. His marriage to Eleanor of Aquitaine made him rich and powerful but they didn’t get along. Henry managed to regain the throne in 1154 and his coronation as Henry II took place at Westminster 12/19/1154. He was the first of the Plantagenet kings, notorious for his stormy relationship with his frienemy Thomas Becket. Henry III’s beautiful tomb resides in Westminster Abbey. Henry III married Eleanor of Provence Berenger (DA). Henry and Eleanor’s heir was Edward (DA). He was crowned Edward I (Longshanks) 1274 in Westminster Abbey. Edward married Eleanor of Castile (DA). Another Edward (DA). 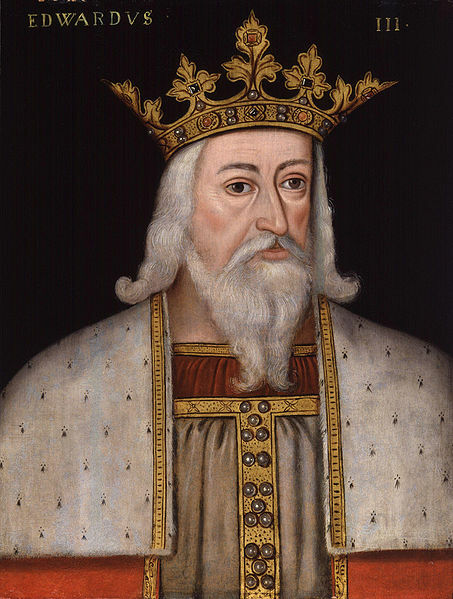 He was crowned Edward III at Westminster Abbey early in 1327/8 – after his father was deposed. John of Gaunt, Plantagenet Duke (DA). He was born Mar Mar 1340 in St Bavon’s Abbey, Ghent, Flanders. He married Constance of Castile for political and dynastic reasons. After she died he married his true love Katherine to legitimize their relationship and their children. Between them, John and Katherine started the Tudor and Yorkist Royal Houses; most of the European Royal Houses trace their origins back to them through intermarriage. I’m going to skim the rest of our line to Lady Elizabeth Brooke, since I don’t think we have Westminster connections again until our ancestors served the Tudors. When Henry VIII “hit on” our Lady Elizabeth Brooke, he was hitting on a distant cousin. Pffft, typical Tudor. Their daughter Margaret Neville married John Brooke, Lord Cobham, 7th Baron of Cobham. Thomas and Dorothy’s daughter was our Lady Elizabeth Brooke who married Sir Thomas Wyatt the Poet!! That’s it. Hope you enjoy our connection to Westminster on this lovely wedding day. (I flew through it to get it done before midnight – please send me a note if you spot errors.) I didn’t take time to go through and check for all the christenings. *Burghers were middle class citizens, not round beef patties in soft white buns. I just wanted to tell you how much I have enjoyed your blog!!! I am also working on tracing the wyatt family on ancestry.com and have gotten to 1000 (the year)straight up the men. I couldn’t go any farther, so I went up through Captain Adam Guyot’s wife, who is William the Conquerer’s daughter. From there, I have gotten straight up to abot 300 BC. If you are on ancestry, my username is audreybarnett111. I am SO buying your book when it comes out. Did you find documentation or other proof that Adam Guyot married William the Conqueror’s daughter? When I see a lot of debate, I stop trusting the information. No, I am just putting my trust all in others’ trees, but I’ll sent a while looking for that. I know that Captain Adam Guyot came to England with William the Conqueror in 1066, so they might have had a good relationship and William let him have his daughter to marry. Also, I haven’t found anything that says they didn’t get married, only things say they did. It is kind of hard to solve that question, as they probably didn’t have marrige records back then. I trust acknowledged trees, but I saw that Adam’s marriage to William’s daughter had been disputed. There are so many contradictions when you go that far back it’s hard to know fact from fiction. I could not find a match for the daughter named and William’s children (if I remember correctly) were well documented. I’ll go back and look. It’s nice to think about but I don’t worry about it because we do know we’re descendants of William and Adam’s line turns into little more than names and dates after he receives his lands. They don’t start getting famous again until Henry Wyatt’s father – Richard I think. Last night I was up until 3 a.m. writing about William’s son, Henry Beauclerc. What a character he was. Our line through Elizabeth Brooke is incredible. According to ancient English manuscripts, the first Wyatt came to England from Normandy, now part of France, but then an independent country, with William the Conquerer. The name then had the Norman-French spelling. Guyot, but the Anglicized spelling changed it first to Wiot; then to Wiat, from there to Wyat in about 1300 and Wyatt at the time the family came to America, 1621. Guyot was the Captain of the Flag Ship of the fleet and ship that carried William to England some 900 hundred years ago. Guyot distinguished himself in the Battle of Hastings. He became a trusted associate of the Conquerer, and then won the hand of his daughter, was granted large estates in Yorkshire, founding the family home at Scuthange. The above was copied from “Wyatt Family – English Lineage” and, while one might think that the author was a Wyatt who had embellished the account of Guyot into a grandiose exaggeration, still you must admit Guyot must have been a person high up in William, the Conquerer’s organization to have been granted those estates in Yorkshire. I will be very interested in your book, of course. More immediately, I am interested in your take on Isabel Wyatt Page, her parentage, etc. I find some doubts & questions, but she seems pivotal in one of my connections to the Wyatt line. Thanks. My mother hired a professional genealogist to determine our line. You might try that?